Set for three weeks after the World Championships, on April 22-24, 2016, organizers are confident of an enthusiastic response from sponsors and advertisers. They have not yet identified any sponsors, but Van Wagner Executive Vice President Chris Pearlman said that demand is high and that the global nature of the property is opening doors to foreign companies that wouldn’t usually sponsor American sports. Van Wagner Sports & Entertainment and U.S. Figure Skating are launching the Team Challenge Cup, a biennial, Ryder Cup-style competition between continents slated to kick off in April. The new event will pit 14-member teams from North America, Europe and Asia against each other over three days with a prize purse of at least $500,000, organizers said. It’s the latest in the emerging team trend in international figure skating, which launched the ISU World Team Trophy in 2009 and introduced a team event to the Winter Olympics in 2014. They will announce the venue of the inaugural Team Challenge Cup on Wednesday. Van Wagner and U.S. Figure Skating, business partners since 2008, each own 50 percent of the new property. Van Wagner contributed the startup capital and David Raith, U.S. Figure Skating executive director, led discussions with the International Skating Union and the various national governing bodies needed to make the event work. More team events serve U.S. Figure Skating’s long-term interests as a governing body as well, Chief Marketing Officer Ramsey Baker said. 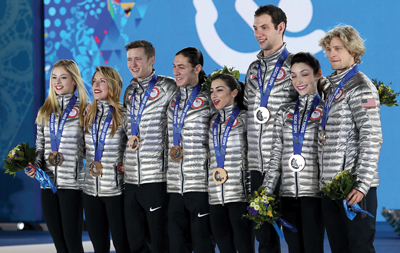 The World Team Trophy and Olympic team events created a new dynamic between elite American skaters, pushing them to live up to each other’s expectations in a way individual pursuits hadn’t, he said. They’re hopeful teaming with Canadians in this event will yield similar success. Van Wagner and USFS bought time on CBS for a two-hour recap telecast at 2 p.m. on April 24, after learning usual broadcast partner NBC’s spring schedule would be difficult to maneuver around. The event will stream live on icenetwork.com, which the governing body owns. The idea for a continental competition was born in June 2014 when Van Wagner CEO Jeff Knapple and Pearlman pitched the concept to Raith and Baker while attending a Yankees game in the Bronx. From there, Raith reached out to the international community, where their idea was met with enthusiasm. In its first year, the partners are emphasizing growth over profitability, leaning on Van Wagner’s capital flexibility, which U.S. Figure Skating lacks as a nonprofit. They aim to rotate the event among the three continents in even-numbered years, serving as a post-Olympics tour stop in Olympic years and an addition to the regular competition calendar in non-Olympic years. Each continental team will be composed of two pairs teams, two ice dance teams, three male singles and three female singles. All but one of the singles competitors will be determined by ISU rankings on Jan. 1, with the final slot filled by a fan vote. Like in the Ryder Cup, each team will have a non-competing senior captain. Kristi Yamaguchi, 1992 Olympic champion, will lead the North Americans, and the United Kingdom’s Christopher Dean will lead Team Europe. Team Asia has not selected its captain. All-event ticket packages will go on sale Oct. 9, and international broadcast schedules are still in development.